1) (Albye, co. Norfolk; granted 10 Feb. 1664). Ar. three crosses crosslet betw. two bendlets gu. 2) Ar. a fesse erm. betw. three towers sa. port gu. Crest—Out of a tower a demi man in armour sidefaced, holding in the dexter hand a sword by the blade in pale. 3) (Tinsley, near Rotherham). Az. a lion ramp. ar. a border erm. This Anglo-Saxon is a locational /habitational surname meaning “of London”. In medieval times and the Middle Ages, the name was given to a person who came from the city of London in England. It’s also possible, that the name was given to a person from elsewhere who visited London and came back to their hometown or farm to tell people about their trip. Such journeys were significant events at the time. The city of London was mentioned by the Roman historian Tacitus around 115 AD, spelled Londinium. 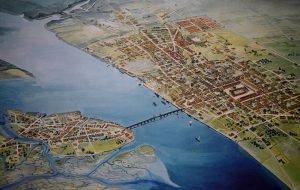 In the Anglo-Saxon Chronicles, the name city was spelled Lundenne in 839 AD. It may be derived from pre-Celtic words meaning “place the navigable or unfordable river”. Alternatively, it may derive from the Celtic word lond, meaning bold or wild. The family first held seat in Berkshire, England. It can also be an Anglicized version of the Jewish surname Landon, London, and Lamdan. Common spelling variants or names with similar etymologies include Laundon, Loynton, Loyndon, Londoner, Londing, Lewnden, Londean, Lundin, Londen, and Lunden. The last name London ranks 2,186th in popularity in terms in the United Status as of the 2000 Census. The name ranks particularly high in the following four states: Louisiana, Maine, Michigan, and Arkansas. In Ireland, the name ranks 5,963th. The name is also present throughout the remainder English speaking world: Canada (2,833rd), New Zealand (2,462nd), Australia (3,578th), and South Africa (5,014th). The earliest known bearer of this surname was Leofsi de Lundonia who listed in the Domesday Book of 1086 AD, which was a survey of England and Wales ordered by William the Conqueror. The Hundred Rolls of 1273 AD, a census of Wales and England, known in Latin as Rotuli Hundredorum lists four bearers of this surname: Haginus de London in county Northumberland and Gilbert de Londonia. Jordan de London was documented in county Berkshire in the Testa de Neville, sive Liber Feodorum. The Placita de Quo Warranto lists one William de London of county Wiltshire. Osbert de London was documented in county Somerset during the first year of the reign of King Edward III of England (1327 AD). Early marriages involving this last name include Susan London to John Hacker in 1570 and Edward London and Elizabeth Phillips at St. Dionis Backchurch in 1730. Sir Hildebrand London was born around 1280 AD and he married Margaret Morely, with whom he had two issue: Robert and Maud. His son Robert was born around 1300. His daughter Maud was born around 1305 and she married Richard Combe, with whom she had three issue: Richard, Felicia (Calston), and Walter. James London Jr. was born in Amherst County, Virginia in 1740 who married Mary Turner and had a son with her named Martin. Hugh Wilson London was born in Canada in around 1818 and he married Mary Isabel Clark with whom he had a son named Melvin James London. Melvin was in Michigan in 1874. Ambrose London was born in England in 1618 who married Mary Cornish and he had the following issue prior to his 1706 death in Maryland: Samuel, Mary (Riggin), Thomas, Ruth (Walston), and Abigail (Lidster). 1) John London of Windsor who was a soldier in Philip’s War. The Connecticut countil of war sent him to prison for coming from the army without license in 1676 and for “many notorious lies” but he was soon released. The author goes on to state “He was engaged in the work of befooling Sir Edmund Andros in 1680, about the regicide Goffe, and swore, 1680, in N. Y, where A. was then Governor, that G. was in April, 1678, living at Hartford, and that James Richards, who was the oldest member of the council, and richest man in the colony, was agent of G, and that if he, L, discovered the matter it would tend to his ruin; and much other preposterous stuff he testif”. Other settlers in colonial America bearing this name include John London (Virginia 1636), Humphrey London (Virginia 1639), Peter London (Virginia 1703), and Martha London (1739). In Canada, one of the earliest bearers was Bartholomew London (1730) who was from New Jersey, but went to Canada as a United Empire Loyalist (i.e. a person who opposed the American Revolution and remained loyal to the British crown). In Australia, one of the first bearers was Jane London, who came to South London in 1849 aboard the Elgin. In New Zealand, one of the earliest bearers was Joseph London who arrived in the city of Wellington in 1840. I have been unable to identify the London family motto. There are hundreds of notable people with the London surname. This page will mention a handful. 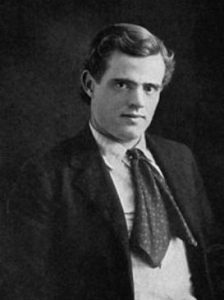 Famous people with this last name include: 1) Jack London (1876-1916), whose real name was John Griffith London) was an American novelist from San Francisco Bay whose famous works include The Call of the Wild, White Fang, and To Build a Fire, 2) Herbert I. London (1939) is an American conservative activist, commentator, and author who is president of the Hudson Institute and a columnist for The Washington House, 3) Meyer London (1871-1926) who was an American political who was a member of the U.S House of Representatives from New York, who is one of only two members of the Socialist Party of America to ever be elected to Congress, 4) Lauren Nicole London (1984) who was an American film actress from Los Angeles, California, 5) Tom London (1889-1963) who is an American veteran actor who played in many western movies, and 6) Paul Michael London (1980) who is a professional wresterl in the WWE from Texas whose ring names are El Gran Luchadore and Sydisitko. The three most prominent symbols in the London Coat of Arms (erroneoulsy called the London Family Crest) are the cross crosslet, tower, and lion rampant.